This summer I read two "classical" Samurai books. I read the Hagakure: The Book of the Samurai by Yamamoto and the Legend of the Five Rings by Mushashi. They are both interesting books. Mushashi's book isn't as interesting to me for what he says in it, but by the way he approached his life. The Hagakure, on the other hand, is a little like listening to the stories and crazy opinions of an old man. Both are filled with things of wisdom, and both have moments where a modern reader might thing "huh?". The Hagakure has many more "huh?" moments than Five Rings. "The first elementary teaching becomes the highest knowledge, and the master still continues to practise this simple training, his every prayer." This is something I try to do. I always want to get better at the basics, learn them again, practice them again, constantly. I feel that "advanced" stuff is actually just the basics looked at in a different way. Unfortunately, I have never mastered anything well enough to prove that. Some other things I learned from Mushashi is he traveled. He did this in order to find the best in his field, to test himself. It applies in modern life too. If you want to play country music you go to Nashville, not Seattle. If you want to work in finance you go to New York, not Las Vegas. The Hagakure has some wisdom in it also. "When the time comes, there is no moment for reasoning. And if you have not done your inquiring beforehand , there is most often shame. Reading books and listening to people's talk are for the purpose of prior resolution." "Throughout your life advance daily, becoming more skillful than yesterday, more skillful than today. This is never-ending." There is also warnings of in-experience. "A person who knows but a little will put on an air of knowledge. This is a matter of inexperience. When someone knows something well, it will not be seen in his manner." The Hagakure also contains strange stuff. "A long time ago this practice was followed, especially in the upper classes, but today even the children of the lower classes perform no executions, and this is extreme negligence." "If you cut a face lengthwise, urinate on it, and trample on it with straw sandals, it is said that the skin will come off. This was heard by the priest Gyojaku when he was in Kyoto. It is information to be treasured." Really? Information to be treasured? Reading these books made me want to make a picture of Tobias as a Samurai. 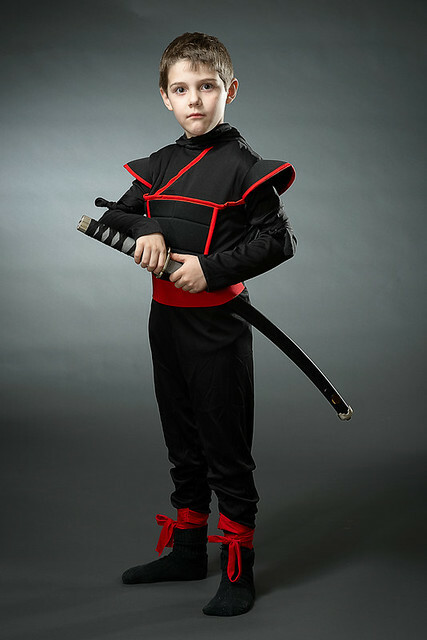 This is really a ninja costume, no one makes Samurai. I have drawn up some armor and a helmet that I think I can construct out of foam, but I haven't had the time to put it together. I also haven't found the foam I want. This will do for now. It is a very basic shot, nothing fancy.